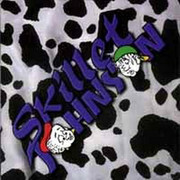 Here's your chance to get an original CD called SKILLET JOHNSON - S/T. This rare 12 track CD was released in 1998 on Steel Pop Music. Totally cheesy hard rock band that will flood your memories of KANE ROBERTS and SIX PACK FLOOZY. When I first saw the front cover of the insert, I knew that I would be in for a real treat. The best way to experience this is to check out the MP3 song sample below and make your bid count!!! I HIGHLY RECOMMEND it. The CD and inserts are in mint condition. another great song by them, if you have any information on this band, place notify me :) thanks I DO NOT OWN THIS MUSIC. В топы не буду забирать, но за оригинальность коллектив нужно обязательно отметить. Как сказать, правильно, чтобы охарактеризовтаь саунд ансамбля? "Интимный", "личный"? Тоже не то..
Сейчас и к нам залью. Так постепенно и закроем все запросы на форуме?